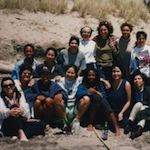 In their own words, "The University of California, Santa Cruz Research Cluster for the Study of Women of Color in Conflict and Collaboration researches, writes, and shares ideas concerning the conditions of women of color in the U.S. and the 'Third World.' Departing from critical perspectives surrounding the category 'women of color,' the cluster's mission involves the study of the complexities of multiple, dispersed, and conflicting identities." Its significant contributions include supporting the History of Consciousness Department's appointment of Dr. Angela Y. Davis, developing and teaching two courses: (in collaboration with faculty from multiple departments) Women of Color and Visual Culture and Women of Color: Gender and Sexualities, hosting workshops and events on personal and professional development, and creating a supportive social community for Women of Color. One of the cluster's most successful and celebrated events was the Women of Color Film Festival. The Women of Color Film Festival worked to combat inherent racisms in the film industry by providing Women of Color filmmakers a venue to share their work. The festival would draw large crowds eager to discuss the films and the issues they raised, such as, global women's rights issues. This digital exhibit showcases some of the materials used to promote the festival and highlights the cluster’s consistent engagement with Women of Color feminisms and non-mainstream perspectives. To learn more about the Women of Color Cluster, please see “Celebrating Innovation and Public Engagement at UC Santa Cruz,” a physical exhibit located on the third floor of McHenry Library at UCSC, on view until October 2017. What makes a "public" university? Whom does a public university serve? In exploring these questions, we considered the influence of these archives across three spheres of public dialogue: the university community, the city of Santa Cruz and state of California, and across the globe. In influencing these communities, the university also transformed itself. This exhibit highlights the contributions these people and organizations made to the university and beyond, and shows ways in which they innovated in their own communities of practice, engaging UCSC students, faculty, and staff along the way. Click on the links below to enter the digital exhibit for each archival collection. 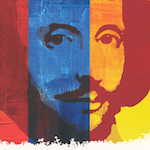 Shakespeare Santa Cruz (SSC) was a professional repertory theater company based in and supported by UC Santa Cruz (UCSC). The non-profit theater company produced an annual summer festival that was started in 1981 and ran until 2013. The archival collection contains production files, administrative files, and key historical documents from almost every production put on by the company. It also contains various media, including recordings and soundtracks of productions and artist interviews. Together, UA 41: Shakespeare Santa Cruz Records is one of the largest archival collections housed in Special Collections, and the largest CART project ever. This website serves two functions: first, it is a brief introduction to the more comprehensive finding aid to the collection, where you can explore the unique history of how Shakespeare Santa Cruz emerged (and only could have) in UCSC’s experimental, creative, and bucolic setting. But secondly, we’ve filtered the material through our own practice of archiving. In grappling with how to select materials from the archive to feature here, we decided to organize the website with three goals: to give a behind-the-scenes look into the production of the festival, to highlight each individual festival and the content of the productions, and to provide a window into the many publics that SSC engaged— from the university setting, to the local community, and even into the larger Shakespeare festival circuit nationally and globally. The website dovetails with a physical exhibition on the third floor of Special Collections at the UCSC McHenry Library, on view until October 2017. Beginning in 1986, the City of Santa Cruz rose to the forefront of growing citizen opposition to offshore oil drilling in California. A coalition of elected officials, including city councilmembers, John Laird and Mardi Wormhoudt, county supervisor and land use lawyer, Gary Patton, and chair of Save our Shores, Kim Tschantz, developed an innovative oppositional strategy. The federal govern­ment holds jurisdiction over offshore leasing areas located between three and two hundred miles off the coast of California. Oil drilling is constitutionally protected as a federal activity. In other words, local communities have no legal standing to oppose oil drilling off their coasts. However, oil drilling does necessitate the construction of a supporting onshore infrastructure, including dewatering plants, heli­copter pads, and pipelines, and these facilities must be approved by local zoning changes. This coalition introduced Measure A, a ballot measure that mandated that any of these zoning changes would have to be approved by a vote of the people of the City of Santa Cruz. The measure passed with 82 percent of the vote. Perhaps most importantly, it also authorized the Santa Cruz City Council to provide funds to lead a fight against offshore oil in Central and Northern California. As a result of Measure A, Santa Cruz activist and UCSC alum Dan Haifley was hired (through Save Our Shores) to coordinate what became known as the Oil Information Program. In the late 1980s, Haifley traveled in his Pinto throughout Coastal California communities showing an educational slideshow he developed entitled Is It Worth the Risk? and consulting via telephone and in person with local government officials and activists interested in passing land use ordinances modeled on the ballot measure that passed in Santa Cruz. Over twenty of such ordinances passed throughout California. Then the oil industry fought back. The Western Oil and Gas Association (later named the Western States Oil and Gas Association) sued thirteen of the communities involved. The communities pooled their resources and hired attorney Roger Beers in San Francisco, who successfully won the case for local governments. This sent a strong political message to Washington, D.C. regard­ing citizen opposition to offshore oil drilling in California, a political message which played an essential role in the next chap­ter of the battle against offshore oil drilling in California, which was the establishment of the Monterey Bay National Marine Sanctuary (MBMNS). Haifley was to be integrally involved in this battle as well. In 1972, Congress had passed the Marine Protection, Research and Sanctuaries Act which, among other things, established the National Marine Sanctuary Program. Title III of the law was later renamed the National Marine Sanctuaries Act. Efforts to cre­ate a marine sanctuary in the Monterey Bay region date back to 1975, when the California Coastal Zone Conservation Commission recommended a sanctuary for the area, but after many years that proposal was eventually rejected by the Reagan administration. This proposal was reintroduced by Congressman Leon Panetta in 1988 and eventually evolved into the 1992 federal designation of a much larger sanctuary, which stretches 276 miles from Cambria in the south to Marin County in the north. Jean H. Langenheim is a distinguished ecologist and educator who has performed interdisciplinary research in the fields of plant ecology, paleobotany, and ethnobotany. The first woman to be promoted to full professor at the University of California Santa Cruz, Langenheim was also the first female faculty member in the natural sciences at UCSC, and served as a pioneering woman leader in a variety of scientific organizations. For more biographical informaiton, see Langenheim's 2010 memoir, The Odyssey of a Woman Field Scientist: A Story of Passion, Persistence, and Patience. In addition, Langenheim's biobibliography includes a full listing of her academic history, publications, professional activity, and more: Jean H. Langenheim biobibliography. This exhibit features images from the Jean H. Langenheim Papers at the UCSC Library Special Collections & Archives, and was created in celebration of Langenheim's 90th birthday in September of 2015. An Uncommon Place traces decisive moments in the creation of UC Santa Cruz, from the 1950s until the late 1970s. This Digital Companion follows the structure of the original exhibit in the Porter College Sesnon Gallery and the Cowell College Eloise Pickard Smith Gallery, marking the early history of UCSC through images and multi-media material. The exhibit was curated by emeriti professors James Clifford, Michael Cowan, Virginia Jansen, and emeritus campus architect Frank Zwart for the 50th Anniversary of UCSC. An innovative educational project. A challenging physical site. The university took shape among steep ravines and dramatic trees in a way that respected, as it transformed, the landscape. Using architectural plans, photographs, and oral histories, the exhibition illustrates paths taken and not taken—decisions, constraints, and hopes. It celebrates the achievement of UCSC’s founding planners while analyzing the tensions and contradictions that were built into their project. Through its many subsequent transformations, the campus remains an extraordinary work of environmental art. This online exhibit calls attention to UC Santa Cruz as utopian experiment where architecture and environment conspire to create an uncommon place, a setting for teaching, research and imagination outside the bounds of the ordinary. In the 1950s - a sustained postwar economic boom and the dramatic growth of the University of California. By the late 1970s - a time of recession, shrinking enrollments, and a construction pause. But, the story is incomplete. The exhibit stops in the late 1970s, a moment of crisis and transformation. Important elements of the university are beyond its scope, including more recent building, the Farm, the Arboretum, Lick Observatory, the emerging coastal campus. Yet the story of UC Santa Cruz as a place of big ambitions and uncommon landscape continues. Follow the links embedded throughout the exhibit to learn more and connect the early history of the campus to its contemporary impact. John Herman Blake was born in Mount Vernon, New York on March 15, 1934. After serving in the U.S. Army during the Korean War, J. Herman Blake earned his B.A. degree in sociology from New York University and an M.A. and Ph.D. in sociology from the University of California at Berkeley. In 1966, Blake was recruited by Founding Chancellor Dean McHenry to teach sociology at Cowell College at the newly opened University of California, Santa Cruz. He became the first African American on the University of California Santa Cruz faculty and remained at UCSC for eighteen years. Dr. Blake is beloved at UCSC, both as a charismatic, rigorous, and brilliant teacher/mentor and as the visionary leader who founded UCSC’s seventh college, Oakes, and served as its first provost. Oakes College emerged from a larger history of grassroots education in transformational politics in the United States centered in the Citizenship School Movement in the Sea Islands of South Carolina and the Highlander Folk School in Appalachia. See Dr. Leslie Lopez's essay (accessed through the link to the left) which explores this unique history of Oakes College. After leaving UC Santa Cruz, Blake served as the President of Tougaloo College until 1987; held positions at Swarthmore College; served as the Vice Chancellor at Indiana University; and was the Director of African American Studies at Iowa State University. In 2008, the Medical University of South Carolina appointed Blake as the first Humanities Scholar in Residence. He retired from the Medical University of South Carolina in December of 2014. Throughout his career, Dr. Blake has focused on students of color in higher education, urban militants in the African American community, and social change and community development in rural and urban African American communities. His publications include over fifty full-length contributions and a book, the autobiography of Huey P. Newton, Revolutionary Suicide. He has been awarded six honorary degrees and two presidential medals. Professor Blake has devoted much of his life to preserving Gullah culture. He was the founding director of the Sea Islands Institute at the University of South Carolina, Beaufort, and is currently Executive Director of the Gullah Geechee Cultural Heritage Corridor. 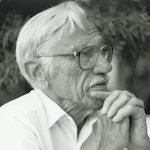 This online exhibit, timed to coincide with "My Unique Journey: Learning Never Ends," Dr. Blake's upcoming talk at the UCSC Library on September 26, 2015 at 11am-12:30 pm features photographs, videos, and other resources about Blake's life, at UCSC and beyond. Curated by Irene Reti, Oral Historian, Special Collections and Archives. 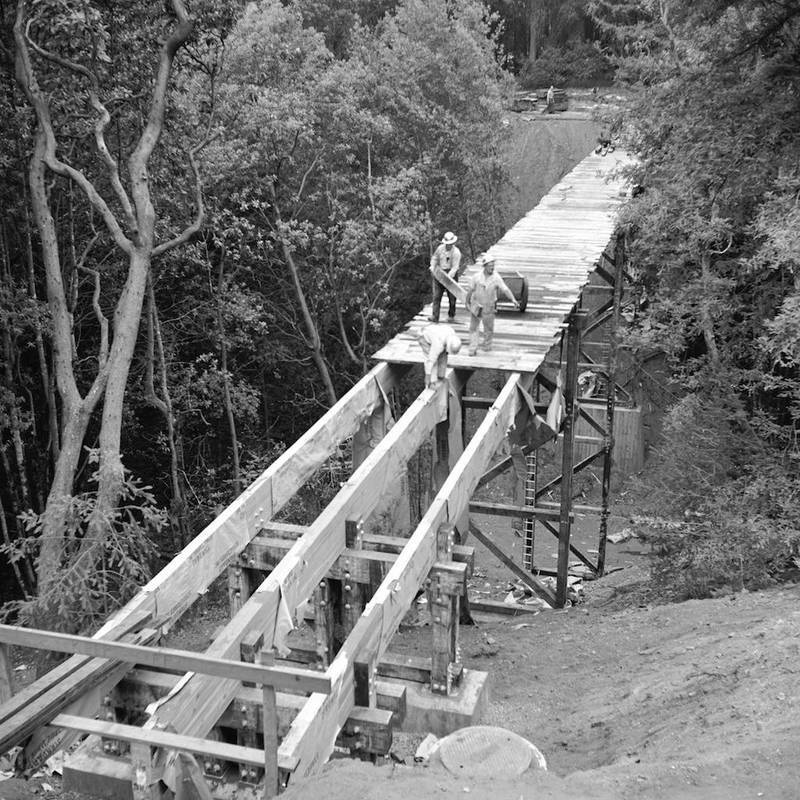 See the Regional History Project's website for the recently published oral history with Dr. J. Herman Blake and much more about UCSC history. Activism in the Archives: Radical Imaginaries in the Papers of Ruth-Marion Baruch, John Thorne, and Karen Tei Yamashita explores the lives and works of three key cultural figures with roots in the northern California region, specifically the San Francisco Bay Area, San Jose, and the Monterey Bay Area. These international icons are united by their dedication to cultural and political activism and their involvement in and/or relationship to the social justice movements of the late 1960s and early 1970s: the Black Power, Flower Power, Red Power, and Yellow Power movements. Drawing from their personal archives of photographs, papers, correspondence, and ephemera, this exhibition highlights the radical imaginative work performed by Baruch, Thorne, and Yamashita in documenting, supporting, and reflecting on these political and cultural movements. It also illuminates the relationships that formed between the movements as the demands for equal rights, justice, and peace reached a critical volume around the world. Activism in the Archives is the culmination of the inaugural year of UCSC Special Collections and Archives Center for Archival Research and Training (CART) fellowship program. Launched in 2014, the CART program is for graduate students who are interested in learning more about archival research. Students work closely with a professional archivist for one quarter to process and describe a collection related to their research interests. 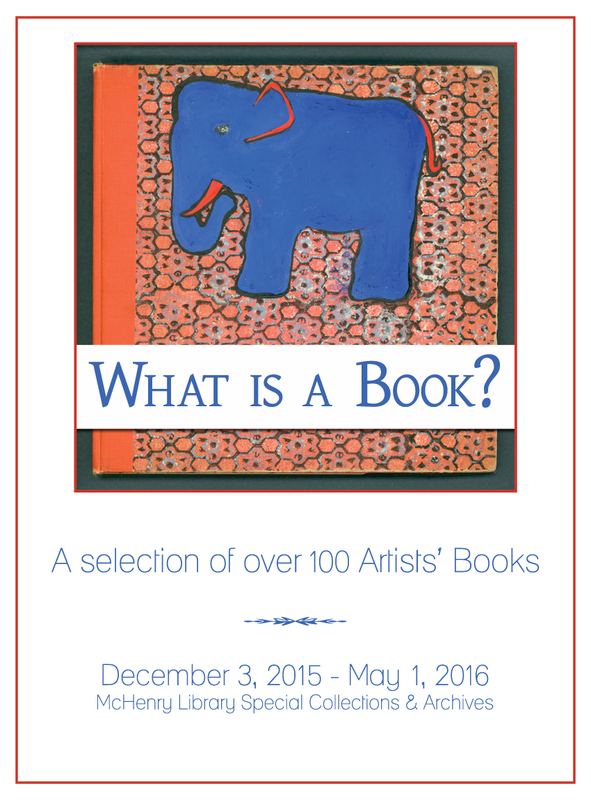 This exhibition, curated by the 2014-2015 CART fellows, was generously sponsored by Claudia and Alec Webster. During the 2015 winter quarter, students from the senior seminar on the “art of the medieval book” organized, prepared and installed both a physical and online exhibit. The class was held in McHenry Library’s Special Collections and taught by Elisabeth Remak-Honnef. The items on exhibit, selected from Special Collections, provide a glimpse of what the students learned throughout the quarter: a survey of about a thousand years of the evolution of book production and use in Europe. Concentrating primarily on medieval illuminated manuscripts, the class looked at different types of books to examine not only how they were made, for whom they were made, how they were used and how and why they were decorated, but also how they have survived. As part of their coursework, students wrote descriptive captions for the items on display as well as longer essays on single manuscripts. Students also selected a 20th or 21st century artists’ book to compare with their medieval manuscript and prepared short reports on such aspects of book production as parchment preparation, pigments and gilding, scripts and paleography, writing materials and binding techniques. Artists and their Books: Medieval and Modern examples from Special Collections focuses on the circumstances under which the books were produced and first used. How were they intended to be used and by whom? What is the relationship between text and image in each of the books, and how does the page layout inform the way a reader looks or looked at the page? The cases contain facsimiles of eight medieval illuminated manuscripts grouped primarily by subject matter and function: religious books, secular books, model books, and alphabet books - including the library’s most recent acquisition, a one-of-a kind artists’ book by San Francisco calligrapher Thomas Ingmire entitled Finnegan’s Facebook. The installation of both the physical and digital exhibits took the place of a final exam and I think that you will agree that the students listed below passed with flying colors! Founding UCSC Chancellor Dean McHenry's education, research, and practical experience in California politics from the 1930s to the 1950s helped him develop the savvy and political acumen to create and lead a boldly experimental campus of the University of California. This digital exhibit explores McHenry's political career, focusing particularly on his participation in Upton Sinclair's 1934 End Poverty in California (EPIC) campaign for governor of California and his key role in authoring the 1960 Master Plan for Higher Education.